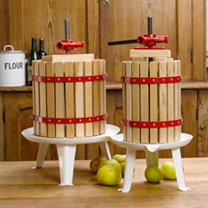 Ideal for pressing apples, grapes and other fruit, our spindle fruit presses combine superb quality with excellent build, and are very easy to use. Just fill the cage with crushed fruit, assemble the two semi-circular pressing plates and the large iron nut on top, and use the iron bar to screw down, the delicious juice flows into the base plate for collection. The press cage is made from fashioned oak staves, the pressure plates and space blocks from beech, all seasoned and coated with food compatible varnish. It has a robust, pressed steel base plate with lip to aid pouring, with wide-set pressed steel legs for stability, and all the pressed steel is protected by a tough baked-on polyester coating for longevity. Delivered fully assembled. Available in 3 sizes: 6 Litre, 12 Litre, 18 Litre. Press your own fruit juice!